Euro NCAP put the 2019 Range Rover Evoque through the test and thanks to the safety tech it comes with, the SUV aced it. From airbags for the driver and passenger, belt pretensioner and loadlimiter, side airbags (head and chest) and ISOFIX at the back, the 2019 Evoque comes fully loaded with safety features. According to the report released by Euro NCAP, the car remained stable in the frontal offset test. Protection for the knees and femurs of the driver and the passenger was good. Chest protection for the driver was adequate. The Evoque managed a similar score in the frontal full-width test – with good protection for the head, thighs and the pelvic region. Chest protection for the driver and the rear passenger was adequate in this test too. In the whiplash rear impact test, the protection for the front seat occupants was good, but for rear seat passengers, it was marginal at best. Aside from all these, the Autonomous Emergency Braking (AEB) System performed well even at highway speeds. Additionally, the car also comes with lane assist, seat-belt reminder for all passengers, and a driver-set speed assistance system. The Evoque that was put to test was the R-Dynamic S trim sporting a 2.0-litre diesel. This right-hand drive iteration is the same version that will make its way to India later in the year. 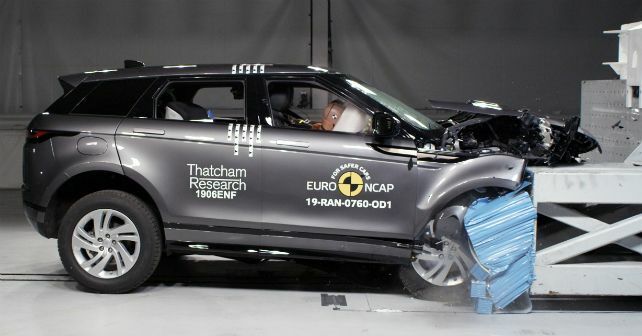 This isn’t the first Land Rover to score a perfect five in Euro NCAP. In 2017, the Land Rover Discovery and the Range Rover Velar also scored five stars.